It’s not very often that I will think about eating soup during the warmer months, I would have smoothies for breakfast, lunch and dinner if I could! It’s just starting to cool down (a little!) here in Perth so I though now would be the perfect time to make a light, fresh soup that could be enjoyed anytime of the year. It went down an absolute treat and with all the garlic I’m hoping to fend of any colds coming my way for the next couple of weeks! 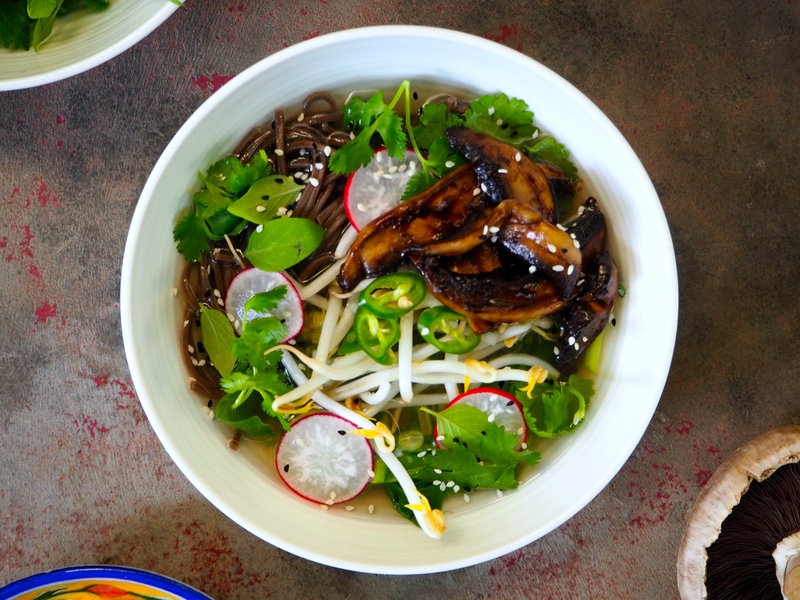 This broth is the perfect base for any vegetables, whatever the season. It’s early autumn here so I have used yu choy as the main leafy green but broccoli, bok choy, zucchini strips or Chinese cabbage would all be delicious. The hot broth is poured over the vegetables, cooking them lightly whilst still keeping everything fresh and crunchy. 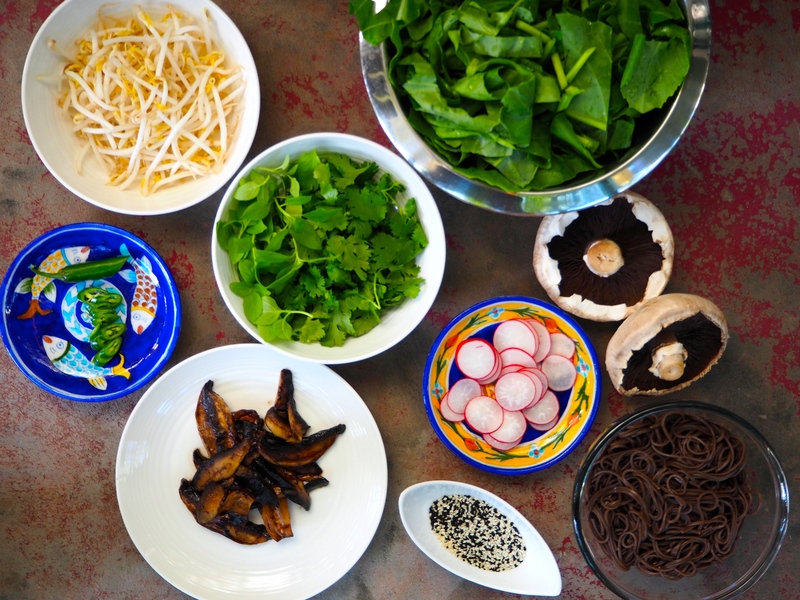 Thai basil leaves, bean sprouts, sesame seeds, chilli and radish to serve. Pull the leaves off the coriander and reserve for serving. Thinly slice the stalks and had to a large pot along with the sliced spring onions, garlic, ginger, cinnamon, star anise, stock and water. Slowly bring to the boil and let simmer for 15 minutes. 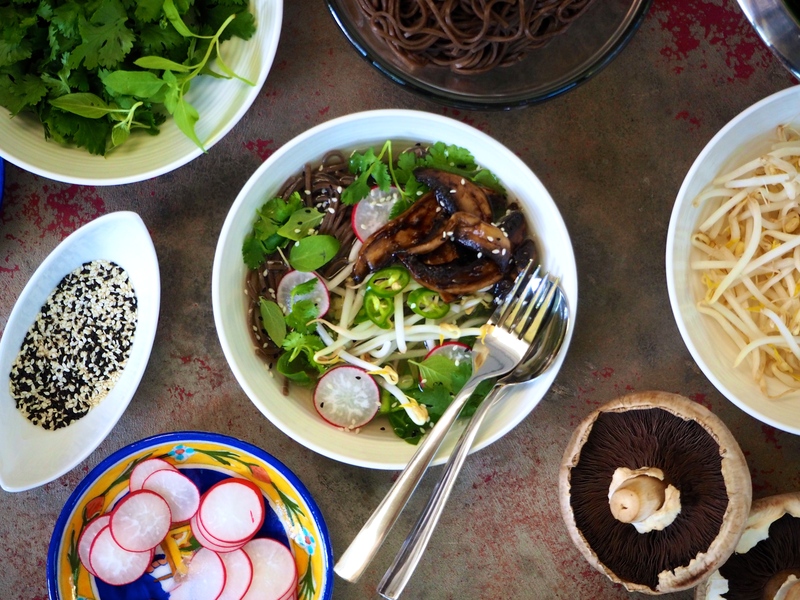 Bring another pan of water to the boil and cook your soba noodles for 5 minutes, or until just tender. Drain and refresh under cool water. Set aside. In the meantime, slice the mushrooms and fry in the olive oil. Once starting to soften add the hoisin sauce and cook for another minute or until nice and sticky and cooked through. Set aside. Wash and slice your yu choy or whatever veggies you have chosen and set aside ready for serving. You can either place everything on your table and let everyone dig in and construct their own soup or serve it up. Either way, place the yu choy (or your choice of veg) in first followed by the noodles and then cover with steaming hot broth. Then top with your desired combination of fresh toppings.